Yoga classes are every Monday from 6:00 p.m. to 7:15 p.m., and a two dollar donation is suggested for members. This is a great way to start off your week. The class Yoga teacher is the very pleasant and generous Ricky Knue who drives in from Conway every week and donates her time to teach the class. All of the money raised goes towards paying the Blanchard Community Club monthly utility bills. Ricky holds a 200 hours RYT with Yoga Alliance, has training in Yoga Therapy, Street Yoga, YogaFit, Anusara, and Iyengar. Do not worry if you do not have any Yoga supplies. Put on comfortable clothes and come on in. Ricky provides Yoga mats, straps, blocks and blankets, or bring your own. Each week different members attend from the community and there is always at least half a dozen new friends to meet or see again…so take advantage of this great opportunity to improve your health and flexibility. 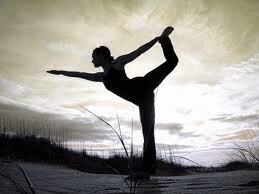 The classes vary in different levels from the brand new beginner to the advanced Yoga enthusiast. There are no worries if you can stand on your head or fall over just standing. Every one has fun and the most important thing is to work at your own pace. There’s no need for competition or self-consciousness. We learn different techniques and positions every week, so we are not expected to be an expert. While you are practicing, you will learn what positions are helpful that support improvements in your overall total health, from digestion, to anxiety, to joint and back pain. People who have gone through knee and hip replacement surgeries come in to enhance their recovery. You can use chairs and walls to support you and work at your own pace. The class ends with a blanket draped over you by the instructor and you relax, letting go all of your thoughts and stresses from the day. 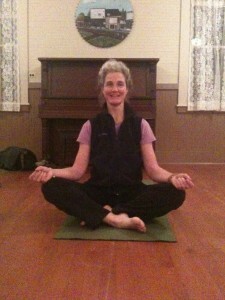 Come on down and see how great introducing Yoga into your life will be! This entry was posted in Classes and tagged Yoga. Bookmark the permalink.